We left Lee Stocking Island yesterday at 0830 and arrived in Blackpoint at 1330 that afternoon. We didn’t have anything we needed to do here, but it’s lucky we stopped. Our friends Karen and Matt (Where II) were anchored here instead of in Staniel Cay. We brought a part for their watermaker from Georgetown and thought we would hand it off to them at Staniel. However, we were able to do that at Blackpoint. It’s always nice to have the opportunity to help other cruisers, and we have certainly been on the receiving end in the past. We went ashore to check out Adderly’s grocery but the mail boat hadn’t come in yet this week. Still she had plenty of supplies. Train to finish off the evening. At 0855 this morning we raised the anchor and left for Staniel Cay, an hour and a half motor sail. First we went to the fuel dock to top off our diesel tanks. While there we picked up the package from Watermakers Air, and snorkeled in Thunderball Grotto. The water was too rough for snorkeling when we were here in February. We were the only ones with wetsuits on but we were very comfortable. We ended up being alone in the grotto. There are some plants in the coral, but the main attraction is all of the colorful tropical fish. We brought cracker crumbs in a zip lock bag to feed them and they swarmed around us. For the first time, we Hero GoPro camera that my son Peter gave us so we might have some photos and/or video to post if he pressed the right button for video. We have been talking to and emailing the Watermakers Air office in Ft. Lauderdale and apparently the computer battery does not qualify for duty free. We have been told by a number of cruisers that if you use your computer for navigation, it is considered a boat part, which has no duty. Also in the package are about 40 pieces of mail. It had arrived an hour before we reached Staniel Cay so there was no waiting and now we have a computer battery so the computer doesn’t have to be plugged in all the time and a 12V charger for the iPad. We had a hitchhiker aboard today. 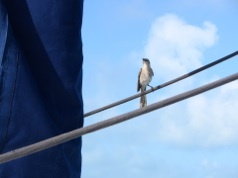 Apparently this mockingbird needed to get to Staniel Cay, so he hitched a ride with us as we left Blackpoint. Hopefully he knew where we were going or it will be a long flight back for him to Blackpoint. 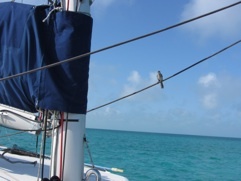 I’ve heard of mocking birds mimicking the voices of other birds but never knew they could mimic sailors. 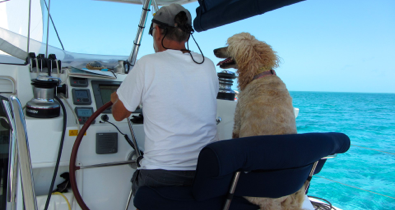 We didn’t see him aboard when we reached Staniel Cay so I hope he found his way home.